Silk screen artist Monky hurriedly posts chicha posters by the side of the road in the San Juan Lurigancho neighborhood of Lima. Cumbia amazónica music started during the late 1960s, in the oil-boom cities of the Peruvian Amazon. The songs were loosely inspired by Colombian cumbias but incorporated the distinctive pentatonic scales of Andean melodies, some Cuban guajiras, and the psychedelic sounds of American surf guitars, wah-wah pedals, Farfisa organs, and Moog synthesizers. In Lima, this style of music emerged as a result of internal migration from rural areas to the city and came to be known as chicha. 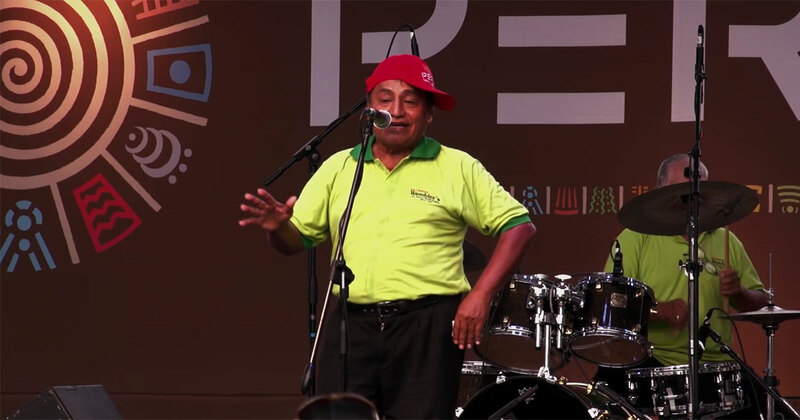 Cumbia amazónica and chicha music illustrate the connections between the global and the local, while contributing to the diversity of Peruvian cultural expressions. 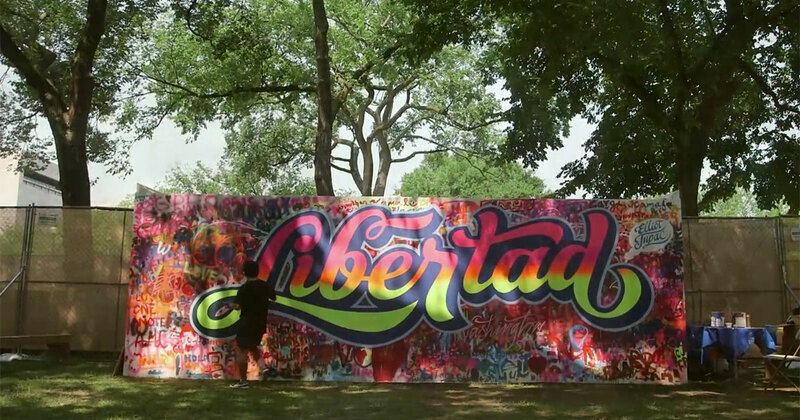 By extension, chicha music created space for graphic street art and posters of the same name. With its bright colors and vibrant sounds, chicha has become an emblem of Peru, allowing often marginalized communities to claim their own public space. Monky removes a chicha poster print from a silk screen in his workshop while his nephew looks on. 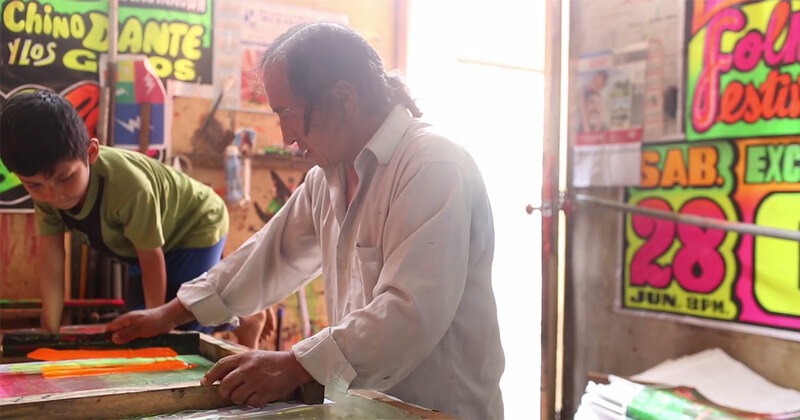 Chicha poster production is a handicraft industry in Peru. Hundreds of posters are mass produced, with the design, cutting, and painting done by hand. Elliot Tupac proudly displays one of his graphic designs in his Lima studio. A painting by Brus Rubio. Amazonian artist Brus Rubio poses wearing a feather crown made for him by his grandmother; one side represents his Bora ethnicity, and the other his Uitoto ethnicity. Members of Los Wembler’s de Iquitos pose together in their neighborhood. Chicha silk-screening is a creation of artists from the central highlands of Junín, who hybridized the prismatic color combinations found on their typical clothing for poster advertisements throughout Peru. Pedro “Monky” Tolomeo is a pioneer of the chicha poster movement in Lima, creating customized phosphorescent posters for iconic groups, including Los Shapis and Chacalón y La Nueva Crema. Elliot Tupac stylizes traditional screen-printing designs and techniques to achieve a new level of valorization for chicha posters. He creates new letterforms inspired by vernacular and street typography as well as cosmopolitan and transnational art. Tupac’s work has become an identity marker in Peru and beyond, welcoming this street art into the gallery world. Over the last twenty years, indigenous Bora painters have used llanchama bark from the Poulsenia armata tree as canvas, offering a unique perspective on their world. 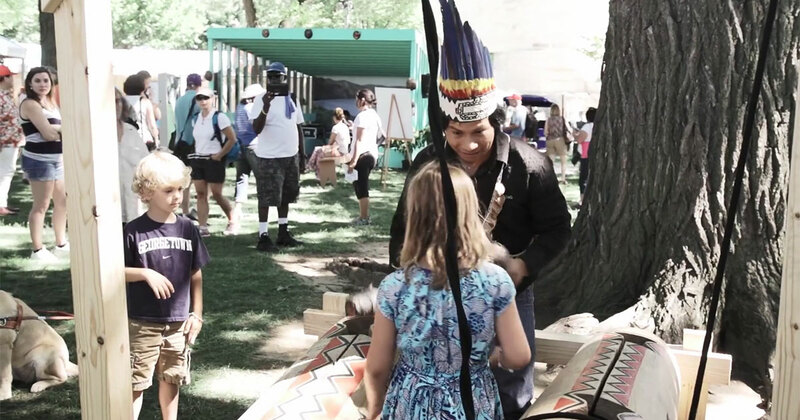 Brus Rubio draws from Huitoto-Bora myths, local stories, and songs in creating expressive visuals that allow intercultural dialogue with non-native viewers. Hailing from the largest city in the Peruvian rainforest, Los Wembler’s de Iquitos are credited with creating the sound of cumbia amazónica, borrowing urban, cosmopolitan, and transnational sounds and hybridizing them with local rhythms and melodies. Unlike other Amazonian groups, Los Wembler’s preserve their original sounds from the 1970s golden age of Peruvian cumbia-chicha, which continues to attract new listeners almost forty years later.